Active Directory Bulk User Creation With All Attributes Including Exchange Mailbox Attributes using CSV Import - ADManager Plus. Creating and managing user accounts in Microsoft Active Directory is a challenging task that all IT administrators face in their day-to-day activities. With the native Active Directory tools, PowerShell scripts or manually provisioning each user and configuring the user properties is extremely time consuming, tiresome, and error prone, particularly in a large, complex Windows network. If you wish to user PowerShell, it requires an in-depth knowledge about the Active Directory to accomplish these tasks and scripting. ADManager Plus is a web-based software that enables you to create multiple user accounts in the Active Directory simultaneously. It also comes with the option to provision users in G Suite. This capability frees you up from the tedious task of writing scripts to create user accounts in bulk. It allows you to create multiple user provisioning templates that contain the standard user attribute values, which can be used in creating bulk users. You can import the user attributes from a CSV file while creating user accounts, which dramatically reduces your time. ADManager Plus enables you to create and manage users, in bulk, with just mouse clicks. With the automated report generation utility, it is possible to export reports in multiple formats to the specified email addresses which will help you to manage the active directory much more efficiently and proactively. You can try out all the user creation options using the free download of ADManager Plus' trial version which provides unlimited access to not just user management features but also the complete set of Active Directory management as well as reporting features. 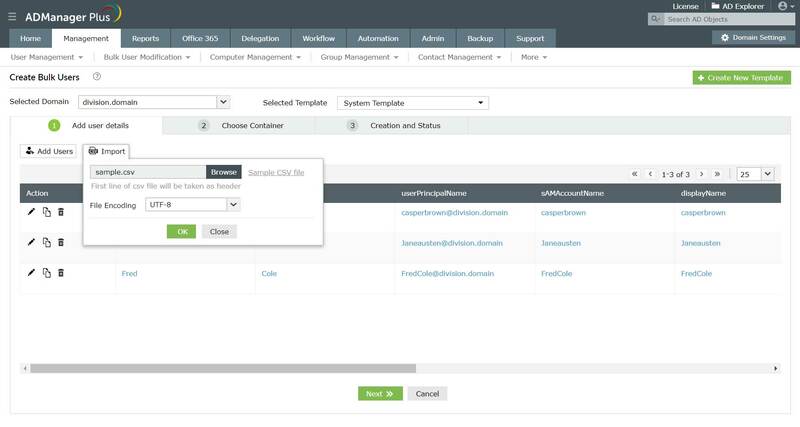 ADManager Plus even allows mass modification of user attributes, including the Exchange, Remote user logon, Terminal Services and Lync Server/LCS/OCS attributes. With ADManager Plus, it is also possible to change the values of user attributes. Common modifications, such as resetting password, changing the display name, creating Exchange mailbox, moving users between OUs, and so on can be done quickly and consistently. You can also modify the attributes of any specific user(s) as per your requirement. Create users by specifying all the attributes including Exchange Server (2003/2007/2010/2013) attributes and Exchange policies, Terminal Services, Office 365 & G Suite attributes. Create users in an existing container or create a new OU and add users to it. ADManager Plus is compatible with Microsoft Windows Active Directory 2000/2003/2008 R2/2012, Microsoft Exchange Server 2007/10/2013, Office 365, G Suite and Lync Server/LCS/OCS. To explore all the features in ADManager Plus, Download the Free 30-day Trial.